The consequences for each Hazard can be configured by Editing the required Hazard. 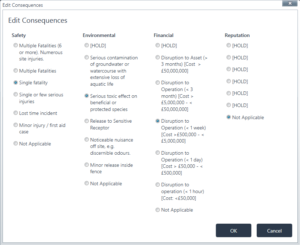 You can rank the severity of each Consequence for the specified Hazard. The corresponding Target Risk Frequency defined in the Risk Profile Configuration is then assigned to the Hazard for each Consequence Category.